My card this week is inspired by Lynda at Understanding Blue. I have CASED her card to create this sympathy card. She has a great tutorial on how to create this card. I wish my sand would not have turned out so dark but I think on my next try I’ll try a lighter brown. I still like the effect of the watercolor technique. My card is also inspired by Hand Stamped Sentiments Inspiration Challenge. 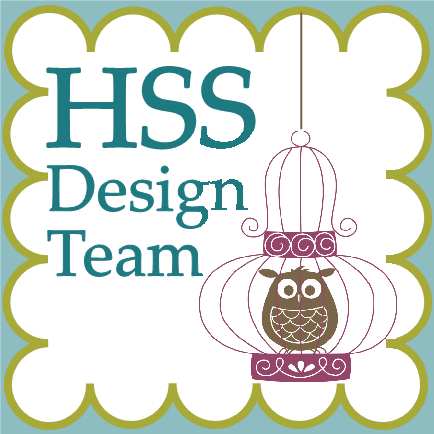 Stop by and see more inspiration from the design team. 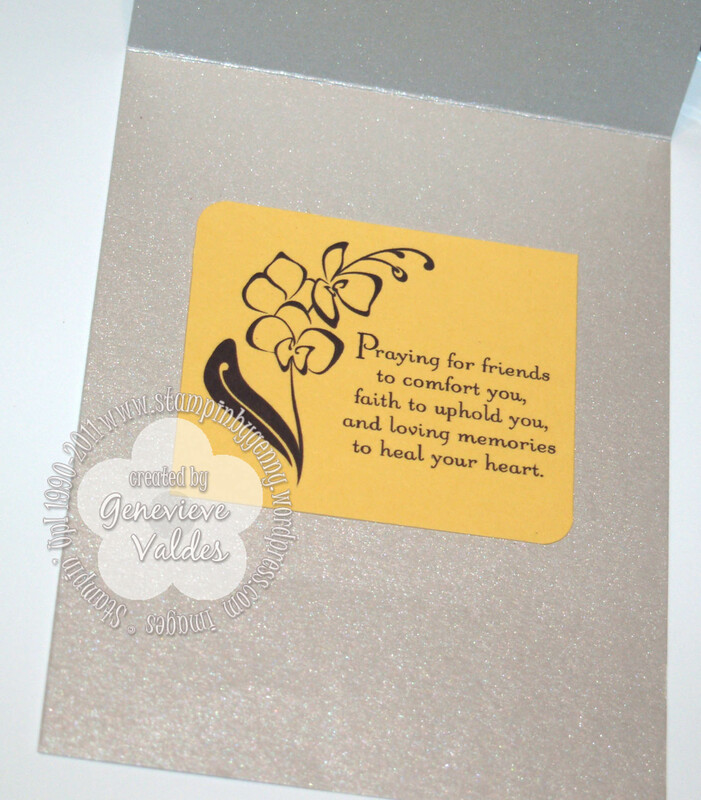 I found myself needing a sympathy card and reached for the Thoughts and Prayers stamp set. My inspiration for this card is from this week’s Hand Stamped Sentiments sketch challenge. The sketch made it easy to put this card together in not time. I used Soft Suede for the card base and Naturals Ivory card stock. I like how these colors look together. The tree and the greeting are embossed with Early Espresso embossing powder. The small buttons on the upper right are from the Vintage Trinkets assortment. I like the transparency of the seam binding ribbon on the side and also used the twine at the bottom of the image to bring focus to the tree. Here’s the sketch I used to create my card. I love this sketch because it has so many possibilities. Visit Hand Stamped Sentiments to see how this sketch inspired our design team. Recently my friend’s mother passed away and I needed to make a sympathy card. She’s a dear friend and I was saddened to hear of the news. I wanted my card to be elegant and to also let her know I was thinking about her and wished her comfort. I wanted my card to be mostly neutral with a hint of color. So Saffron was perfect. I used a butterfly image because I think when our time here on earth is over our soul or energy, like a caterpillar turning into a butterfly, we transform into something else. The butterfly image I used is retired Stipple Butterfly. 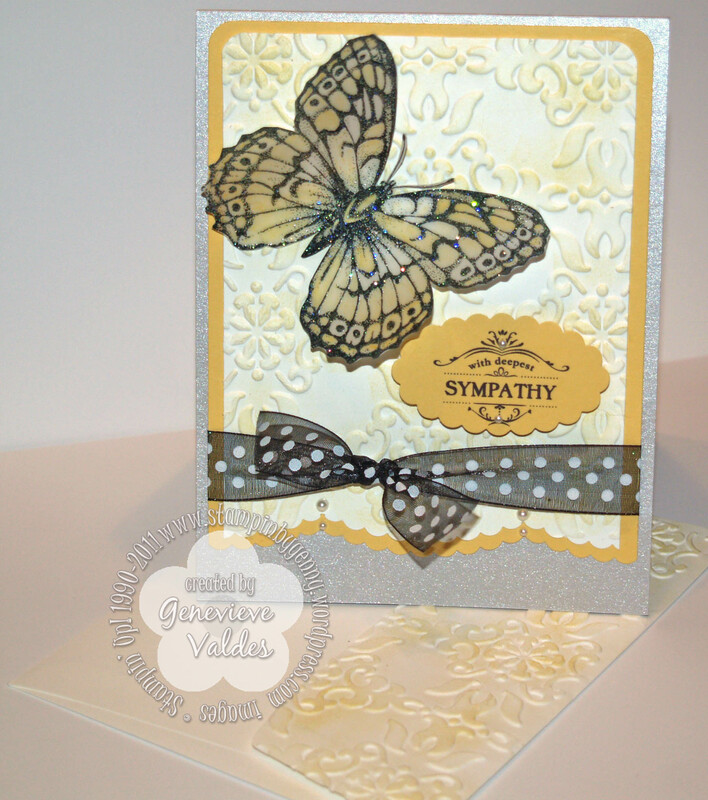 I stamped the butterfly image with Versamark and Basic Black ink then embossed it with Iridescent Ice embossing powder. I then used a yellow watercolor pencil with a blender pen to color the wings. The embossing powder adds just a bit of shimmer. Click on the image below to see the shimmer. I embossed the background and the envelope flap with the Vintage Wallpaper folder then sponged with So Saffron ink. See card recipe below for more details.